Disclosure: I have been asked to cover this upcoming event in exchange for entry, however all opinions expressed are my own. What are you doing next Wednesday? Need to unwind and get ready for the weekend? Want to have some fun with your girls? Still looking for that Classic outfit? 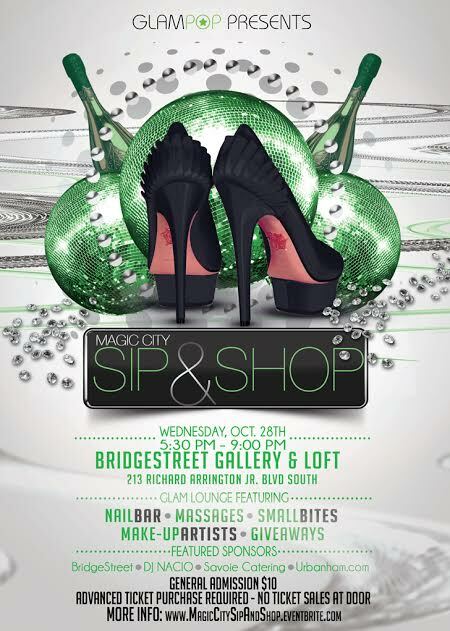 Then come out to the Magic City Sip and Shop and enjoy a little pampering in the midst of some retail therapy. And we can’t forget the sips and small bites! It promises to be a fun night. And there will be giveaways. You don’t want to miss this event. Hope to see you next Wednesday (October 28, 2015) at the Bridgestreet Galley & Loft between 5:30 – 9:00. Get your tickets here. Tickets are $10 in advance or $15 at the door. Nice…I don’t live in B’ham but wish I could go with….Can’t wait to read your article and see pics from the event. Thanks for reading and commenting. Wish you could come.